Rising from its recent 2nd Annual General Meeting (AGM) and Social Meet 4.0 hosted by the Nigerian Stock Exchange (NSE), Vice President of the Fintech Association of Nigeria (FintechNGR), Ade Bajomo, has said that the focus of the Association shall continue to be on breeding young innovators right from the school so as to deepen the growth of the sub-sector in Nigeria. Bajomo, who doubles as ED, IT & Operations at Access Bank Plc., also noted that the Association strongly believes the future of the nation rests on its teeming youths being properly trained into playing active roles in digitalizing the economy. Earlier in his welcome address, Dr Segun Aina, President of the Association told the audience that 2018 was an exciting year for fintech which continue to transform many industries especially the financial services industry in terms of breakthroughs in innovation and investment globally and especially in the African continent. Dr Aina who attributed the success of the Association during the year to the quality, commitment and contributions of members averred that the Association pursued vigorously its three core objectives of CONNECT, ADVOCATE and ACCELERATE to gross its impacts across the length and breadth of the Nigerian and African Fintech ecosystem. Wole Oyeniran, Director, Technology, Deloitte, West-Africa, a member of the Governing Council of the Association, who opened up to the participants on the future plans of the Association, said in order to consolidate on the Association’s successes, maximize its impacts and value delivery to its diverse members as well project a future, the Association has mapped out an audacious road map to cover the period 2019 to 2021. He added that the Roadmap is expected to usher in significant changes in membership categories, growth and value offerings while creating other more sustainable revenue sources and strengthening of internal capacity and governance. Olufemi Awoyemi, Founder & CEO, Proshare and member of the Governing Council of the Association explained to participants that the Association has set rolling a number of strategic programmes for the year aimed at stimulating more regulatory engagements, attract more investments and equipping young Nigerians with the ability to play actively in the digital age. Business Hilights gathered that some of the key decisions taken at the meeting were unanimous adoption of the audited financial statements of the Association and approval to implement the outcomes of the 2019-2021 Roadmap. The Chief Host of the event and CEO of NSE, Mr Oscar Onyema, who is also a member of the Association stressed that the Exchange strongly appreciates the roles of Fintechs, revealing that NSE has developed a policy aimed at fostering corporate governance, exposed startups to investors and facilitate listing on the Exchange. The event was well attended by key executives and management staff of member institutions and ecosystem stakeholders including Banks, Consulting, Legal, ICT Venture Capitalists and Investment firms, Research Institute and Tertiary Institutions, Professional bodies, core Fintech firms, Startups, financial services providers, students, media houses, Regulators including the Central Bank of Nigeria amongst others. 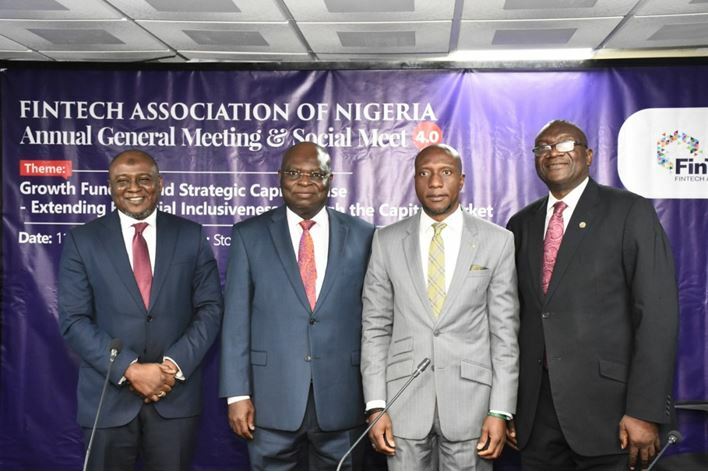 Besides, the 2019 FintechNGR AGM witnessed a roll call of milestones achieved by the Association in 2018 which include facilitation of Fintech Adoption Roadmap in the Capital Markets, participation in the CBN FSS 2020 Strategy Retreat, significant membership increase, inauguration of the Africa Fintech Network, partnership and support for the take-off of the UK-Africa Investment Group, an initiative of the UK Government, creation and leadership of the Fintech Sub-Committee of Nigeria Economic Summit Group, NESG amongst others.